PRINCETON, FL – March 28, 2012 – TWN Industries Inc., the original water transfer printing supplier, announces the release of its new paint line from U.S. Paint. TWN has teamed up with U.S. Paint to offer base coats and topcoats specifically designed for the water transfer printing process that are also durable enough to withstand the elements. U.S. 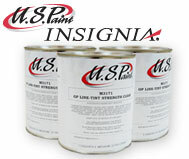 Paint develops quality paints currently used in the automotive, marine, motorcycle, and power sports industry. DTP Plus Base coats – The Direct To Paint (DTP) base coats come in many colors, however Fall Tan and Galaxy Black are the colors initially stocked by TWN. These base coats do not require adhesion promoter, when used on certain plastics. Flat Clear – Developed for the firearm and bow markets, this topcoat has great chemical and wear resistance while maintaining a matte appearance. Insignia Soft Touch – Durability and ease of use make this topcoat a good match for almost any application where a soft feel is desired. Enhanced Low Gloss Clear – Commonly used on ATVs, this topcoat has built in UV protection. Good for products exposed to the elements. High Solids Clear – A high gloss topcoat used in the automotive and motorcycle industry. Developed to build film quickly while being sag and run resistant. “We wanted to be able to offer our water transfer printing processors paints that are approved for the automotive, marine, and power sports industry. U.S. Paints are trusted by major manufacturers and have been tested to a wide variety of OEM and ASTM standards. We are proud to partner with them and be able to put forward these high quality paints,” said Mike Richards TWN Industries Director of Business Development. For questions or to place an order call 305-258-9622.